When we were in Ipswich MA with Barbara and Ed we went to see the wolves in nearby Wolf Hollow. Wolf Hollow is a centre dedicated to educating people about all things wolf and it was fab to see these beautiful animals up close. I bought some wolf cards to send home. Ed, Michael and myself had some fun doodling on them. …and for once the cards got home before we did. Zumis. Our daily coffee/office place when in Ipswich Ma. Zumis. Our daily coffee/office place when in Ipswich Ma- window seat. …so you’d think that the minute I sent off Owl Bat Bat Owl I’d be straight into the next project, right? I thought so too. I always think so and I’m always wrong. After a few euphoric hours end-of-book ennui sets in and has to be gotten over. Himself was also at the end of a book. We took a few days off and went west. When we got back I was raring to go. The novel was first on my list but I decided I couldn’t write another word until I made character sheets. I cleared the kitchen table to spread out the profiles as I made them. I’d written two when I realised I needed to hoover. The whole house. And put on a wash.
Then I realised I couldn’t possibly write about my characters while the ones in the book I was reading were in my head. I made a hot chocolate and curled up in a chair to finish reading it – totally necessary from a work point-of-view, I promise. Next day a couple more character descriptions made it onto A4 coloured card and hit the table before I found myself on my knees cleaning the kitchen cupboard doors. I couldn’t possibly ignore the drips and fingerprints on them for another moment, despite managing to do so perfectly well for three years a fair while. Meanwhile Michael, having sent off all the interior art for his book, still had to design a cover. 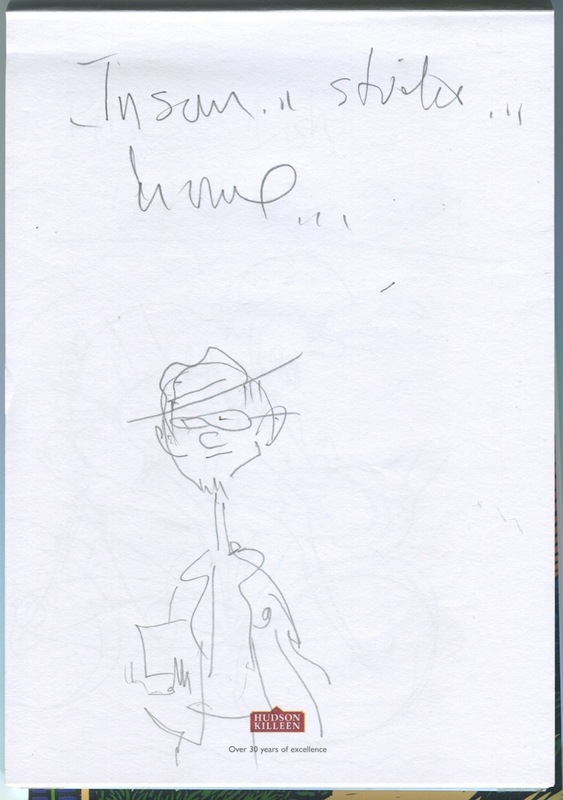 But first he headed off to Woodies to get some plywood to make the bullet-proof case he will post the finished cover in – art is sometimes damaged in transit. However Michael came back with plywood PLUS several lengths of wooden plank. 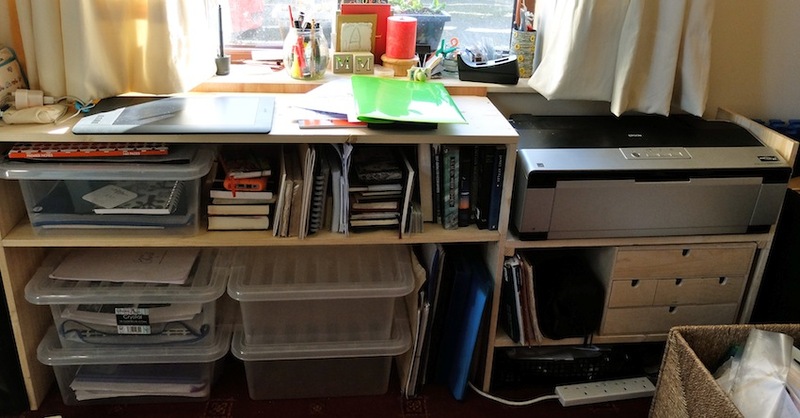 The piles of books and work dotted around the house were getting on his nerves so much he absolutely had to make a new set of bookshelves and some work-in-progress shelves to go beside the computer desk. Twenty-four hours later we had new furniture and he finally began his cover designs. I now had a table full of character sheets but felt compelled to sort and arrange my projects into the new work shelves. At the end of which I realised I wasn’t ready for the novel – it needs more research. 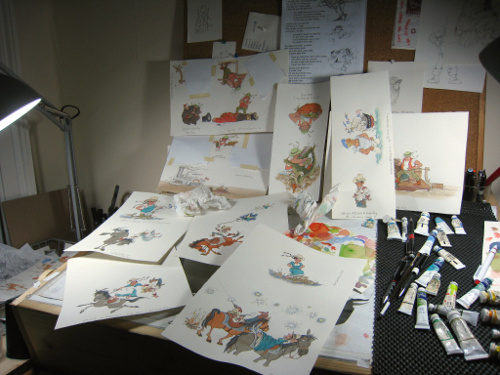 Instead I will get cracking on the two picturebook ideas… though I’ll need to clear off my drawing desk first. I’ll go do that now. I will. Cross my heart. Just as soon as I finish writing this blog. the end…The End…no, really, THE END. Finishing a book can turn into a cascade of endings. I’ve been ‘finishing’ Owl Bat Bat Owl for months. All the main interior art was ‘done’ before we headed to the USA for Thanksgiving, but that still left the title page, endpapers and cover, so I set to REALLY finishing it when I came back. But there was even more fickity feckity stuff I spotted myself. And stuff Michael pointed out – it often takes a fresh eye to notice things this late in the game. So many things to sort that I had to list them image by image, then go through methodically and tick them off as done. This is my first time illustrating a book digitally and I found it involves way more tweaking than usual. With physical art there is a point at which tweaking could destroy the piece so you have to just let it be – with digital you can go on messing indefinitely. There have been books where ‘I don’t care’ won the day so I’ve got to live with those flaws I was too tired to fix. This time ‘steady, steady’ won – I even pulled the cover back from my art editor for more tweaks (one for Michael, two for me) after she’d already given it the thumbs up. But the thing is there will always be flaws, stuff which could have been better. You could go on fixing and polishing indefinitely – how do you know when to STOP? Usually it’s the publishing schedule that dictates when you have to let go at last but the problem with all that final polishing is you risk your art losing vital energy, spontaneity, freshness, so at some point IT HAS TO END. It’s the same with a novel. In theory you can keep reworking; in reality (in my opinion) books can die from overworking. You’ve got to abandon* this book and take what you’ve learnt onto the next one. 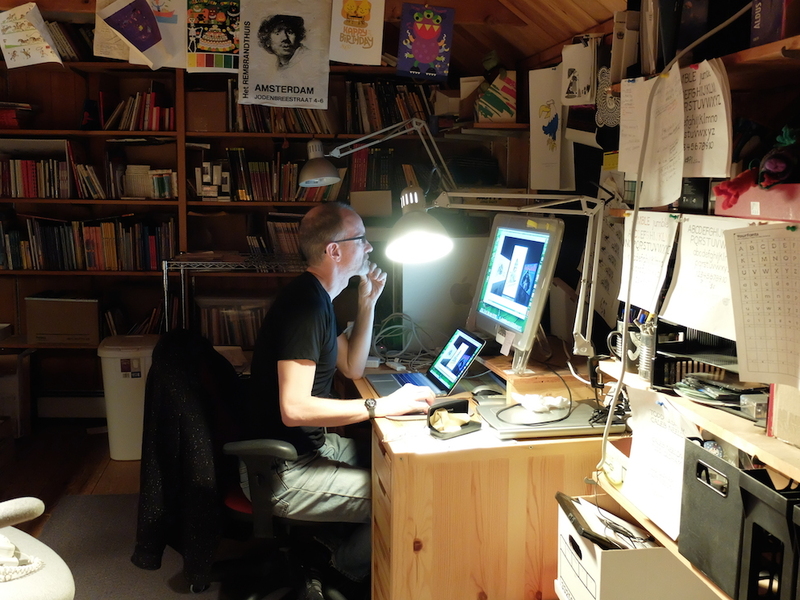 When I finally put the memory stick of files in the post I was at the stage where I could no longer see the images as images, the characters as characters – they had become just so many pixels. I was way beyond doing positive work on it so it was time to let it go. While out and about today and tonight, take the precaution of going about in disguise to avoid being recognised and spirited away by ghosties, gouls or faery folk. Also, carry a book. …just like the rest of us! 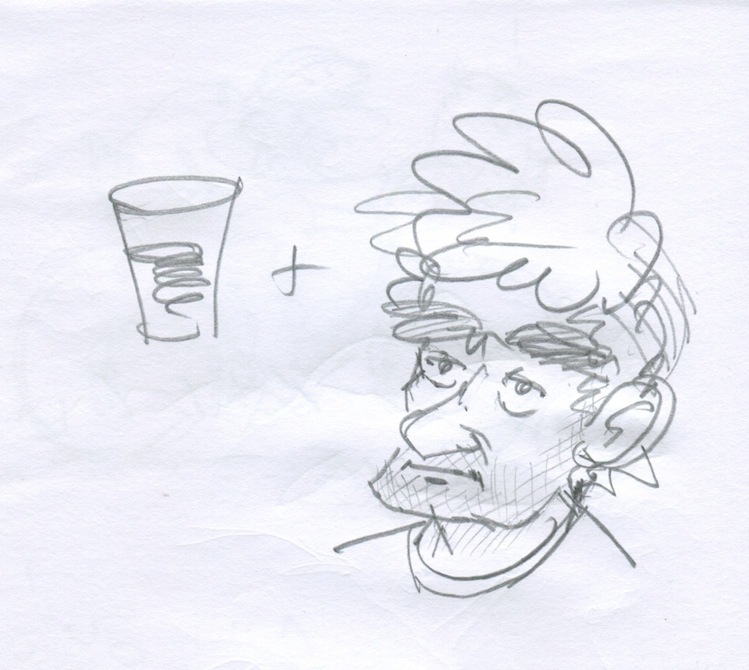 Sometimes the sketches are seriously minimalist…. And occasionally I may come home late in the day and find Michael’s …. … down the pub. In this case, with Peter! Here’s a link to a fab interview Michael just did with Julie Danielson on her blog, Seven Impossible Things Before Breakfast. LOADS and LOADS of preliminary sketches to eyeball, chat about writing and illustrating picture books and growing up in a writing/illustrating household! We’re in the US for a fairly long visit. Both of us need to get some work done while we’re here and Ed has kindly lent us his studio spaces. Top photo is Michael at work in Ed’s computer room, bottom photo is me sketching in Ed’s studio, snow on the ground outside. Both rooms were Michael’s bedroom at some point in his childhood! 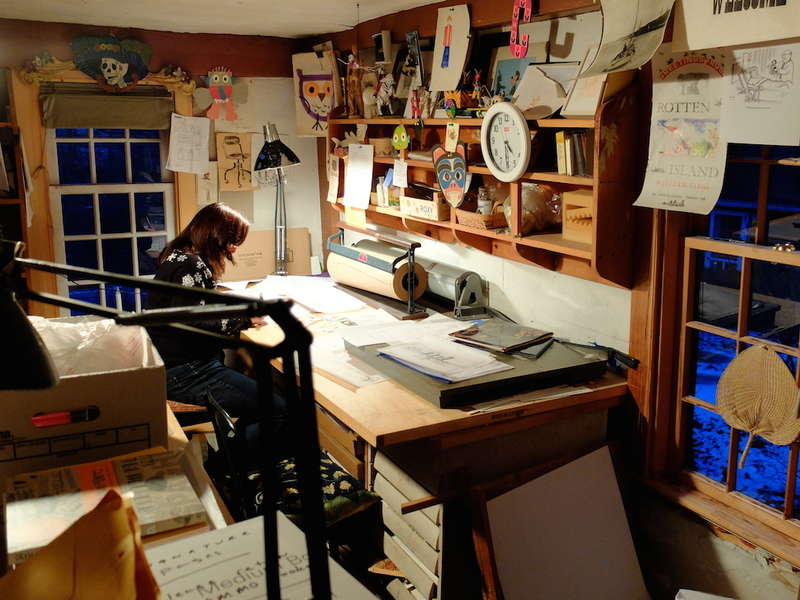 Ed has worked in this house for over fifty years creating some of his most famous books and like all visual artists he has surrounded himself with stuff – images, books, items which interest him, tools of the trade. The photos below will give you a taste of the space – watch out for a couple of family photos lurking in the background, Ed Emberley originals, and a sketch from another famous illustrator. 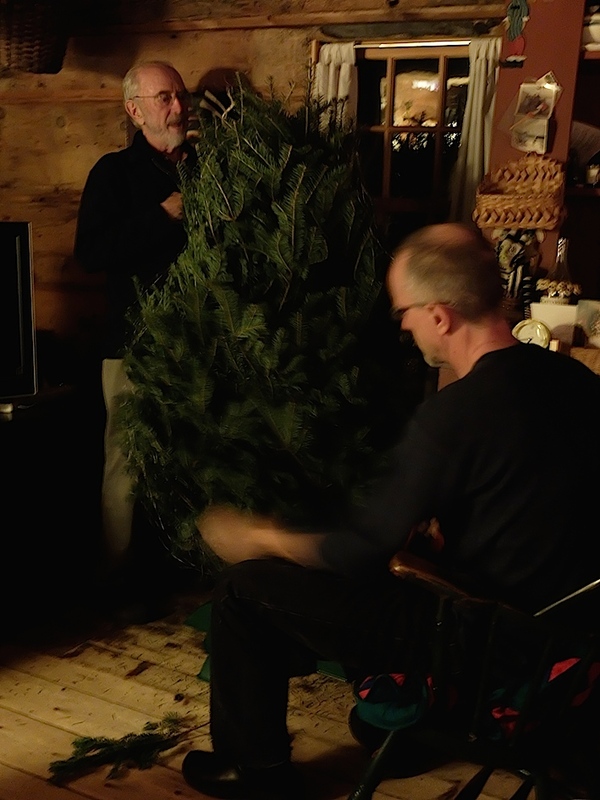 Trimming the tree at Ed and Barbara’s. 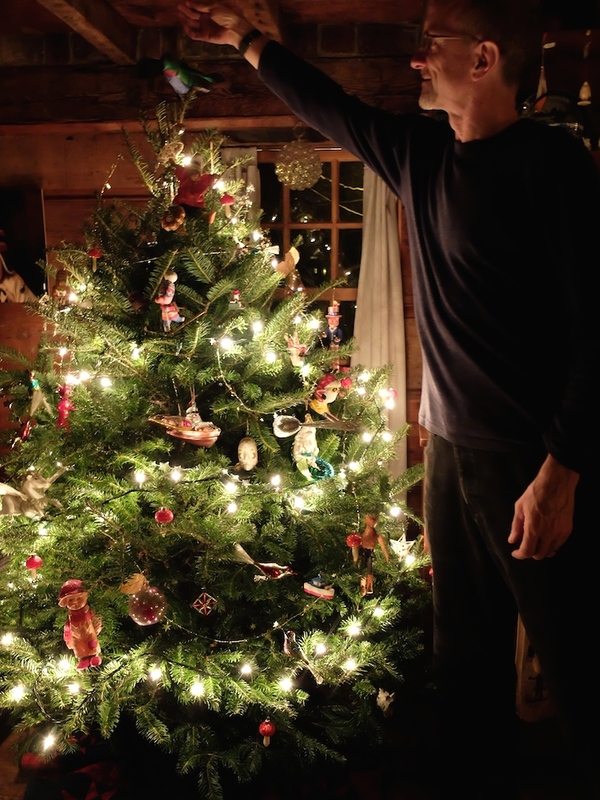 Many of the ornaments were hand-carved by Ed over the years. Some ornaments commemorate something significant from the year that was, others depict family interests – skiing, cycling, sailing. Aren’t they great? The selection below include a Pegasus which Michael carved when he was in school. 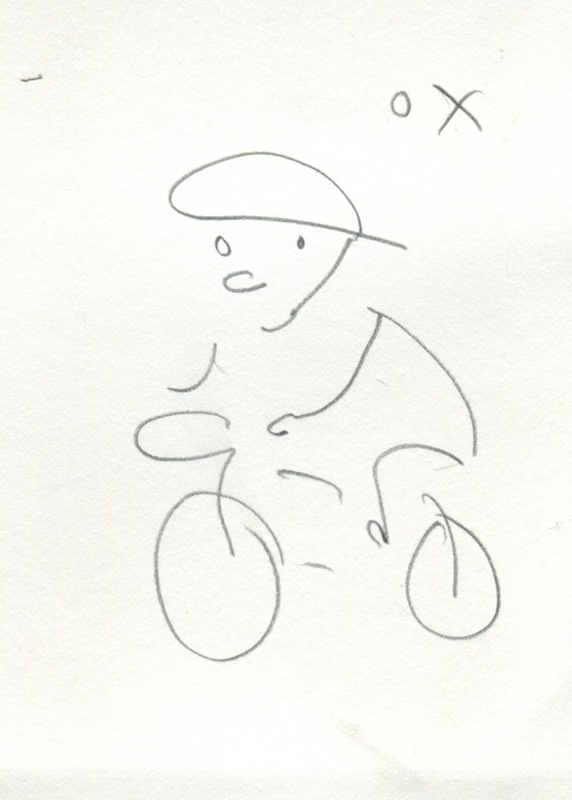 A cyclist for ’75 -wonder why Ed carved one of those…. Season’s greetings to everyone and a peaceful new year. In Parts one through three of this blog I talked about creating the art for the children’s picture book, Miss Brooks Story Nook, (were stories are told and ogres are welcome), from the very first sketches, to finished pencil drawings ready for painting. Below are finished drawings clipped up on my studio wall. You can see two smaller drawings clipped to the top, which is new art for this spread, I decided on after I supposedly had, um, finished. I try not to do this kind of last minute endless changing, it can lead to madness. I’m never completely happy with what I’ve done anyway. But… sometimes it’s worth it. And this was one of those times. For whatever reason I can only guess at now, I decided to paint the rejected drawings along with the new art meant to replace them. This turned out to be a dumb thing to do, as you’ll see later. I mix the colors I will definitely need ahead of time – hopefully enough for the entire book. I’ll use good, expensive paint and brushes, and nice porcelain pots like the one above. (I think I might have stolen that one from my father years ago). It never pays to scrimp on materials. You always regret it. I’ll mix skin colors for the main character, Missy, first, then certain specific colors for her blue overalls and the pink and green stripes of her hat, that have to be used as they are from the previous book. Then I’ll paint them all at once, so they look consistent throughout the book. I can spend an hour painting little green stripes. That’s why I put all the art up on the wall. So I can scan for every place the striped hat appears. And Yes, I do screw up sometimes and somehow not notice one stupid hat and have to try and salvage dried up paint to match it with the other hats as much as possible. It can be frustrating to not have a single finished painting until the book is all done. But it’s the only way I know to do it without color shifts. Below you can see one of my aging brain tricks, which is to mix colors and label them since I forget instantly what exact colors I used for something. And it even matters what brand of color you use. Rembrandt Rose Madder Genuine will not mix the same way as Windsor and Newton Rose Madder Genuine. No two colors are exactly the same, and mixing the exact same color twice is practically impossible, which is why I mix a bunch of some color I plan on using. If I do run out, I can try and remember what I used. As you can see first I did Missy’s skin, hair, then the striped hat, blue overalls, and Billy’s skin hair, and turquoise track suit. Then the rest of the colors. Below is the final color painted art. The scarf is in similar colors as her hat, but it was OK to paint them at different times, because they are not the same. The top image is not going to be used in the final book , but, as I said before, I painted them anyway. And below is the right hand page of the spread. It’s particularly important to make sure pages that will be seen together, if they have the same character, in the same clothes, they need to be the same. Below is the first printed proof for the book, with my notes, and with the wrong art on the top left. And it’s all because I inexplicably painted it in. Someone naturally assumed this was the correct art. Who wouldn’t? I covered it with a piece of paper taped over but it wasn’t enough. Below is the final, fixed spread as it appears in the book with the new art on top. By the time the book is finished, the studio is a mess, with palettes of color mixed paint, and test paint papers all over. A contrast to the small pile of neat illustrations to be mailed to the Knopf art director in New York. Miss Brooks Story Nook, The Art – Part One. Miss Brooks Story Nook, The Art – Part Two. Miss Brooks Story Nook, The Art – Part Three. In parts one and two of this blog entry, I talked about creating the sketches and then the finish pencil drawings for the children’s picture book, Miss Brooks Story Nook (where tales are told and ogres are welcome). In this segment I’ll talk more about bringing the art closer to the finished, full color, printed artwork, some abandoned ideas, and evolving final layout. Below are the finished pencil drawings for the spread in the book I’ve been using as an example. The scene is near at the end of the book, where the main character, Missy, confronts her nemesis, Billy. One of the themes of the book is about the power of storytelling. As you can see, there is an element of fantasy in the book, where Missy’s story telling is meant to be so vivid it comes alive. This was a complicated idea to illustrate, but it happens a lot in children’s books so I’ve had experience dealing with it before. Missy, who is telling a tale about her neighbor’s snake she has been given as a gift, needs to be seen as both, “giving Billy her best ‘snake-eyed’ look”, but she cannot actually turn into a snake because I was told she couldn’t. At this point I can’t remember who rejected that idea, there are so many back and forth exchanges when I’m creating the art with the editor, designer, author (and possibly sales people). but it was one of many ideas that was shelved for one reason or the other. But you can see in the finish drawing and sketch to the right, I still used the “snake-eye” idea as a three part point of view sequence, but removed it and any other suggestion Missy has become part snake. So I ended up using just two visual interpretations of Missy manifesting a snake through her storytelling – eyes and scarf. In the sketches above and left you can see me working out the extent of cartoon vs. realism for the snake, and the rejected “missy-snake” idea.This one even has a scarf like tail… The snake popping out Billy’s eyes so that they bounce down the sidewalk(pavement) is in the text and in the final book art, but without glasses and hat. I rather like the Missy snake. It certainly looks nightmarish enough to scare away a thuggish brute like Billy. 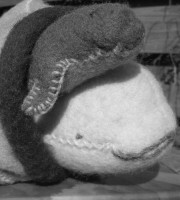 Then there was a idea of what the snake was supposed to do to Billy. Before the text changed to popping his eyes out, it was a basic, “It’s gonna eat you up!” or something like that. So I drew that scene too. I like the idea of the bully being devoured. Like so many rejected ideas, maybe I’ll get to use it in some other book. On Friday, in part 4, the painting begins.